A Harry Potter Cross-Generational Humanities Class from Kristin Cornelius on Vimeo. Intellectually, the class revolved around complex issues of children’s and teens’ literature. The undergraduates had been asked to read an essay by Perry Nodelman (“The Other: Orientalism, Colonialism, and Children’s Literature,” 1992) that poses the question: why is children’s literature written so often in a way that projects onto children what adults think they should feel and might fantasize about–in essence treating children as colonized “others” or “foreigners”? In the video, the undergraduates and their young guests are shown talking to each other at several tables around the room; and the children are interviewed at the end about their reactions to the experience. “The college students really understood what we were talking about,” one child says. Chatterjee notes that the college students were “rather surprised by the insights of the children,” especially their theories and backstories for why the character Voldemort became the way he is and why he might not be so bad. “I thought it worked out pretty well,” she adds. 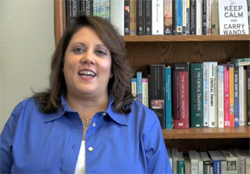 Chatterjee is Associate Professor and Graduate Director of English at CSUN (bio). In relation to her interest in the Harry Potter novels, she has presented a paper on “The Vivisection of the Soul: Harry Potter as Voldemort’s Monstrous Progeny” at the Ninth Biennial Conference of the International Gothic Association on Monstrous Media/Spectral Subjects, July 21-24, 2009, Lancaster, UK. She has a forthcoming article on Harry Potter: “Gothic Half-Bloods: Maternal Kinship in Rowling’s Harry Potter Series” in Gothic Kinship, eds. Sue Zlosnik and Agnes Andeweg. Manchester: Manchester University Press. Forthcoming 2013. Currently, she is working on a book on the literary politics of William Godwin and radical women writers of the 1790s, and on an article on the school story from Tom Brown’s Schooldays to the Harry Potter series and Ishiguro’s Never Let Me Go.